Tokyo, April 10, 2019 --- AMADA HOLDINGS CO., LTD. (TSE: 6113, AMADA HOLDINGS) today announced that it has decided to construct a human-friendly next-generation manufacturing model utilizing IoT at its main factories in Japan through collaborative creation with Hitachi, Ltd. (TSE: 6501, Hitachi). Hands-free assembly navigation system and automatic production planning system, etc. will be built at the Fujinomiya Works and the Toki Works of AMADA CO., LTD. (AMADA), a company of the AMADA Group that handles sheet-metal processing machines, by April 2020. The AMADA Group will promote a transformation to manufacturing workplaces where diverse human resources can be utilized by not only increasing productivity at its manufacturing workplaces, but also working actively on changes in the work environment such as the elimination of labor shortage and Work Style Reform through the realization of "human-friendly cutting-edge manufacturing" by utilizing IoT. Hitachi will, through collaborative creation with customers, share their important issues and create solutions together with them and also provide the Lumada solutions utilizing advanced digital technologies to contribute to the resolution of customer issues and achievement of the SDGs (1). Hitachi is developing Lumada solutions by utilizing advanced digital technologies including IoT. At the Hitachi Group, Hitachi Industrial Equipment Systems Co., Ltd. has been contributing to the enhancement and streamlining of the manufacturing workplaces of AMADA such as by delivering servomotors for punching machines to the Fujinomiya Works of AMADA in 2007 and starting up systems at the tooling IoT factory (2) at the Toki Works in 2017. In light of Hitachi's strength of being able to respond to a broad range of needs from products to OT (Operational Technology) and IT in an integrated manner, which Hitachi has been cultivating for many years as a manufacturer on its own, in addition to the track record described above, the AMADA Group and Hitachi have commenced collaborative creation toward the construction of a next-generation manufacturing model utilizing IoT since June 2018. 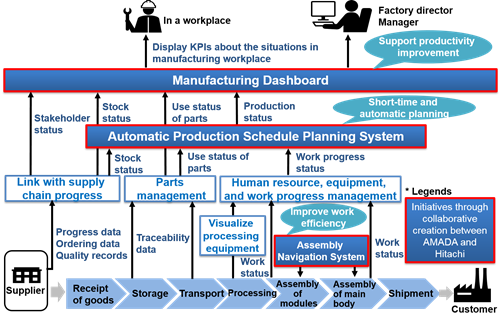 As the second step, to quickly and flexibly achieve various kind/lot production (3), which always entails changes in a production plan, AMADA will commence the construction of the "Automatic Production Schedule Planning System" that has been developed based on the "Factory simulator", an automatic production planning system that has been adopted at Hitachi's Omika Works. 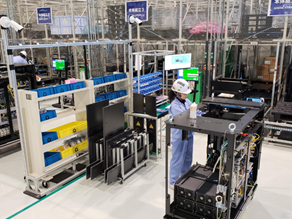 Together with the "Manufacturing Dashboard" that visualizes KPIs at the manufacturing workplaces' situations in a unified manner, the systems will begin operating at the Fujinomiya and Toki Works in fiscal year 2020. Utilizing the 4M (4) in the manufacturing workplaces, the Manufacturing Dashboard shows useful KPIs in graphic form and chronological order when each managing layer such as a factory manager and a production line supervisor considers productivity improvement measures. Specifically, it sets information about the supply situation of parts, the capacity utilization status, and work efficiency of human resources as KPIs and visualizes waste at the factories in an easy-to-understand manner. This will enable each managing layer to promptly accelerate the cycle from the understanding of the situation to the identification, assessment, analysis and improvement of issues from the perspective of total optimization. Of the 17 global goals of the Sustainable Development Goals (SDGs) announced by the United Nations in 2015, the Hitachi Group is focusing on achieving five goals to which it will greatly contribute through its business strategy and six goals to which it will contribute through corporate commitment. Various kind/lot production: A type of production in which the product type for production varies from period to period and the production volume also varies each time. 4M:Man, Machine, Material, and Method.